smarter communities for the future. More than 50% of the world’s population lives in urban areas, with 3 million new people moving into cities each week. Between increased demands on already stressed, aging infrastructure and the need to deliver essential city services to their community, cities are faced with the daunting challenge of doing more than ever before with less available resources. Think Big Partners has extensive experience with IoT technologies and in-depth expertise in the smart city space. As the co-founder of the Kansas City Smart + Connected City project, Think Big Partners helped create the initial smart city master plan that led to a $15.7 million public-private partnership that became operational in 2016. Recently, this project won the Golden Edison Award, considered to be “the Oscar for Innovation”. Think Big Partners also operates the KC Living Lab, an innovation-focused emerging civic technology lab in which we help companies commercialize smart city solutions while also providing due-diligence for city officials and industrial IoT technology users. We are building out a network of lab partners across the world in which we can test and validate smart city applications in nearly any environment, through pilots, demo installations and controlled alpha and beta deployments. Since 2016, Think Big Partners has helped numerous public organizations (cities, municipalities, states) and private companies (Fortune 100 to smaller, privately held) with their smart city master planning and related IoT technology innovation needs. Using our unique innovation process, PRISM (Problem-focused Reverse Innovation Sequence Method), Think Big Partners has helped stakeholders identify high-value problems and civic goals to produce vendor agnostic, outcomes-based smart city roadmaps and deliver executable, phase-based smart city master plans. The Smart City Revolution is Here. When the right smart city technology components are properly installed and operated, cities can save money, increase efficiency and modernize infrastructure, delivering more value to their citizens while building a scalable technology foundation to support future urban growth needs. While the smart city value proposition is high, the risks for cities to fully receive this value is great. 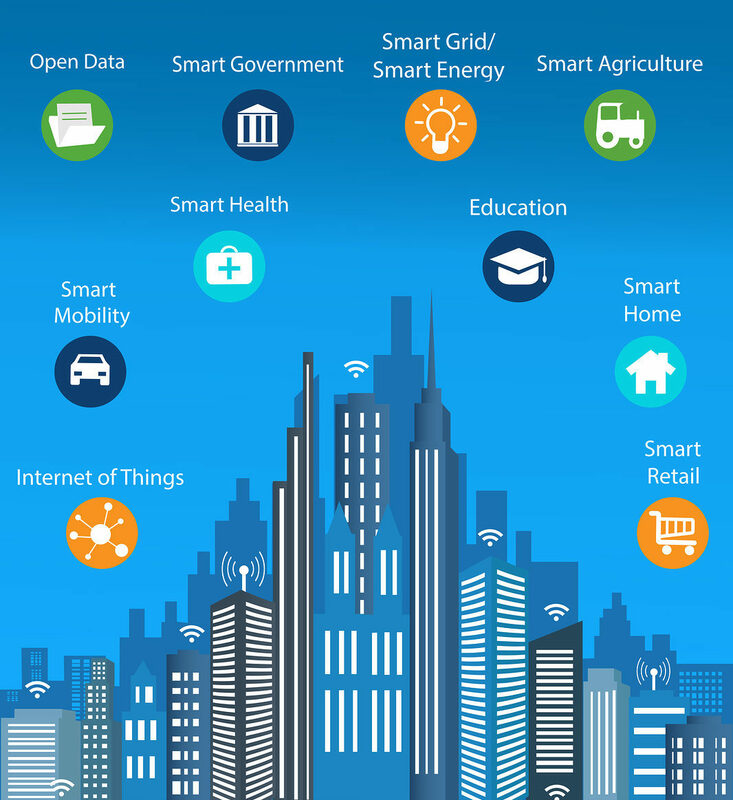 The promise of smart city technology, primarily based on “Internet of Things” (IoT) technologies has been in the public domain almost two decades. But due to historical technology limitations, large-scale smart city deployments have only been successful in the past few years. Emerging technologies are an already challenging proposition for cities to consider and this risk is further compounded when you realize that smart city technology success lies in connecting assets through a wide variety of sensors, beacons and other applications that all produce enormous volumes of data. Success often relies on being able to identify technologies that actually work as advertised, versus technology that may not be quite ready for full market deployment. With the rapid emergence and proliferation of smart city technologies, a pragmatic and current-market based understanding of all vendors, capabilities, and operating profiles is required in order to avoid costly mistakes. With our IoT technology expertise, we can synthesize the needs of cities versus the available technologies and help ensure selection of the right partners to produce a measurable return on investment (ROI) for all stakeholders, especially citizens. We serve as a trusted advisor to our clients who are wanting to make smart city technology, asset selection or master planning decisions. Creating holistic, technology and vendor agnostic smart city master plans that match the problems and goals of a community to smart city solutions and funding models and delivering them in an executable roadmap. Creating competitive financial models that can fund smart city opportunities using traditional, non-traditional and alternative monetization methods. Due diligence of specific smart city assets to evaluate technology capabilities, vendor history, implementation requirements, CapEx and OpEx financing options, monetization models and future operational capabilities (product roadmap, interoperability, open API’s, etc.). Helping cities save time and money by identifying solution-based technology combinations that work in tandem to unlock additional financial, social, political and scientific value through complementary data and the creation of a robust integrated application layer. Facilitating internal dialogues inside cities with a wide variety of municipal stakeholders to create inter-departmental collaboration opportunities that share in benefits and maximize the impact of smart city asset deployments. Developing innovation-based product roadmaps and market requirement documents for both large companies and emerging technology startups that reflect smart city technology market needs (voice of the customer) and associated risks. Specialized smart city technology due diligence and market assessments for investors and entrepreneurs seeking emerging technology market opportunities. Ready to start building your smart community? Contact us below and let’s get started.